Last week, it was revealed that Apple had pulled support for using the forthcoming AirPrint wireless printing functionality for iOS 4.2 devices to print to printers shared on PCs and Macs, restricting the feature to a handful of HP printers supporting AirPrint directly. While several hacks to enable support for shared printers on AirPrint surfaced, a pair of commercial software releases are now providing a way for everyday users to enable the functionality on Mac OS X Leopard and Snow Leopard once iOS 4.2 finally debuts without the need to modify system files. 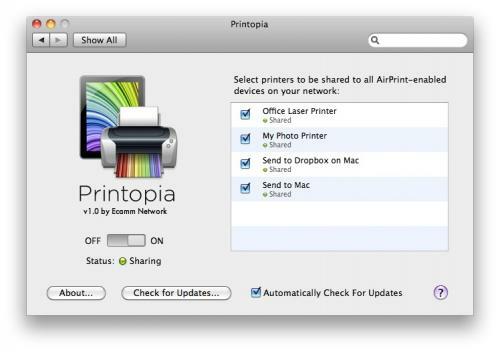 Printopia from Ecamm Network installs as a preference pane in System Preferences and allows users to easily select which local and networked printers should be shared to iOS 4.2 devices on the local network. Users can also send print jobs from iOS 4.2 devices directly to their Macs (including Dropbox folders for automatic syncing), allowing for easy export of PDF/JPEG files without the need for actual printing. Printopia is priced at $9.95 with a 7-day free trial available. FingerPrint from Collobos Software similarly offers Bonjour-based sharing of printers for AirPrint functionality managed through a standalone application. FingerPrint is priced at $7.99 and is also available as a 7-day free trial.